From smart locks to automated lighting systems, energy-saving appliances and home automation have completely changed the way we live our lives. 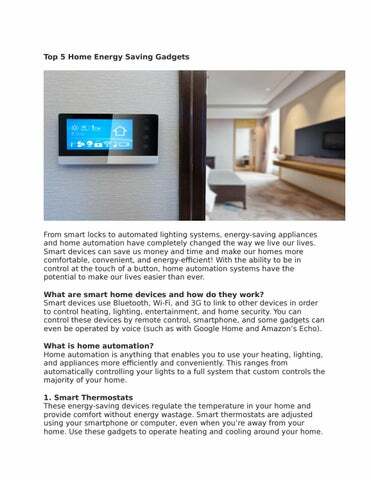 Smart devices can save us money and time and make our homes more comfortable, convenient, and energy-efficient! With the ability to be in control at the touch of a button, home automation systems have the potential to make our lives easier than ever. What are smart home devices and how do they work? Smart devices use Bluetooth, Wi-Fi, and 3G to link to other devices in order to control heating, lighting, entertainment, and home security. You can control these devices by remote control, smartphone, and some gadgets can even be operated by voice (such as with Google Home and Amazonâ&#x20AC;&#x2122;s Echo). What is home automation? Home automation is anything that enables you to use your heating, lighting, and appliances more efficiently and conveniently. This ranges from automatically controlling your lights to a full system that custom controls the majority of your home. 1. Smart Thermostats These energy-saving devices regulate the temperature in your home and provide comfort without energy wastage. Smart thermostats are adjusted using your smartphone or computer, even when youâ&#x20AC;&#x2122;re away from your home. Use these gadgets to operate heating and cooling around your home. For example, by interlinking the thermostat with your air conditioning, you can program your machine to turn on or off depending on the temperature. 2. Smart Fridges From the touchscreen, you can control your groceries, calendars, notes, and photos. The cameras inside the fridge connect to your phone, allowing you to see what you have inside. You eliminate wastage by receiving notifications when something expires soon, and you can order food directly from the app on the screen. 3. Smart Lighting Smart lighting saves energy and increases convenience. This is because smart bulbs use less power, last longer, and are easily controlled. Using scheduled timers and mobile device controls make smart lighting convenient. Itâ&#x20AC;&#x2122;s also a great way to save money on your energy bills! 4. Virtual Assistants Virtual assistants, like Alexa or Siri, connect to your smart gadgets. These include your lights, thermostat, security system, and entertainment centre. Using voice commands, you can turn your lights or television on and off, among a number of other actions. 5. Smart Locks Smart locks use your smartphone as the key. You control who has access to your home and you can see who has used the lock. Some locks have to be installed, but there are some which fit over your existing lock.